The mono album cover obsession/examination continues, this time looking at Massive Attack’s Mezzanine. 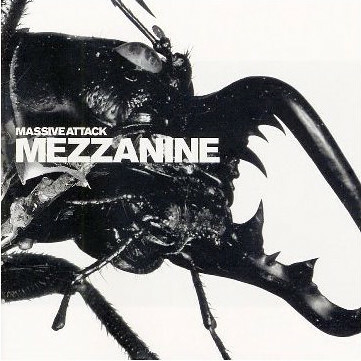 I can’t say I’ve ever been a big fan of the whole ‘trip hop’ scene, but Massive Attack are a whole different animal, as ably demonstrated by the cover to Mezzanine. If listening to the album conjures anything immediately, it’s a creeping menace that builds as the music progresses. The heavy metal beetle on the cover certainly qualifies for the creepy bit, it’s also a brilliant way to express what you can expect from the music. It’s an amazing graphic representation of the juxtaposition of beauty and ugliness, calmness and anxiety, the brooding intensity of the songs. Both graphics and sounds are confrontational, perfectly complimenting each other. The artwork is a collaboration between designer Tom Hingston, fashion/art photographer Nick Night and Massive Attack band member 3D. Tom Hingston had this to say about the collaboration.